Tilbury Fort was built in the late 17th century and replaced a smaller blockhouse built during the reign of Henry VIII. Tilbury Fort was built at a time when artillery was the main weapon and it was designed to take advantage of this. It was low lying and earthen to withstand the shock of bombardment. 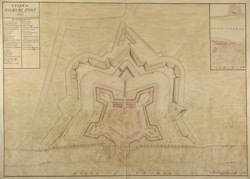 Large cannons were mounted along the river bank and a double line of moats protected the fort being attacked from the landward directions.